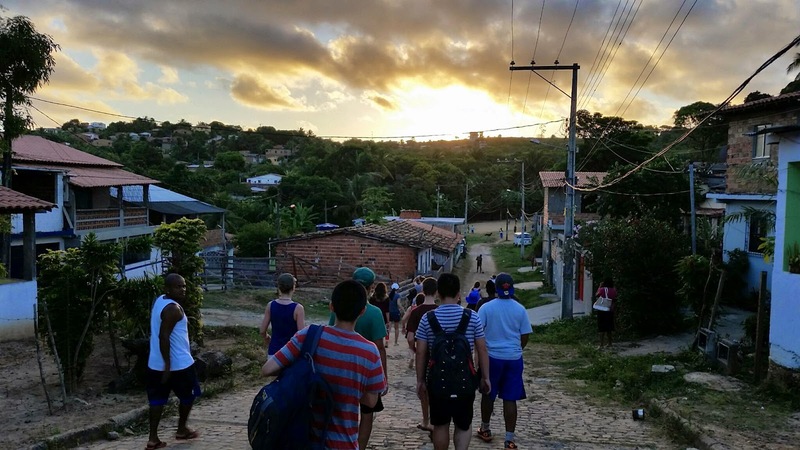 On our last day in Itaparica, we were introduced to many new people providing fresh voices and perspectives. After spending some time cleaning up the beach, we were treated to paddle boarding lessons from one of the top stars of the sport of windsurfing, Marlon Santos de Jesus. Marlon, helped us as we navigated through the shallow waters of the bay. Over breakfast, Aline Pisani talked to us about environmental issues in the country. Aline studied marine biology in Portugal and James Cook University in Australia. Marcus Lin enjoyed hearing about recent conservation and education efforts in preventing people from killing wildlife. Next up, we got active and moving as Reitel do Berimbau introduced us more in depth to capoeira. Emily Miller talked to the group after our capoeira lesson about her research and active learning during the trip. We saw and participated in both forms of capoeira during our trip. Emily further described the differences between Angola and Regional capoeira for us, and also detailed the historical trajectory of capoeira from a more violent form of self-defense to a more benign martial art. Our afternoon was packed with activities, as we started with wading across an estuary in order to get to a secluded lunch spot on the beach. Next we visited a 19th century fort on the shore that was used in defense against Dutch invasions. Javier explained that while the Portuguese were fighting off the Dutch, they copied their state of the art architecture in constructing their base. We then moved across the island to visit the remnants of a 16th century Jesuit-built church. The ruins were fascinating, if eery. 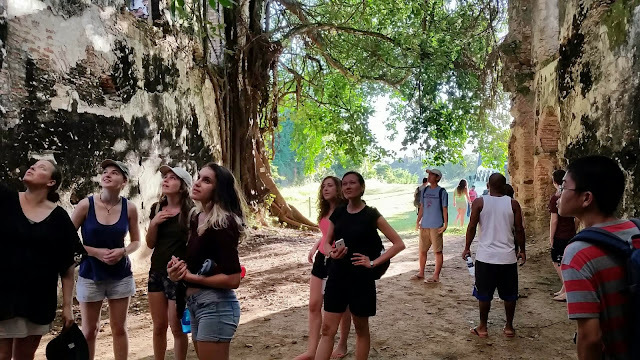 Abby Mihaly thought that the place was hauntingly beautiful, as the trees were taking over the stone foundation of the church. The group recalled learning about the history of the Jesuits in the country, in converting indigenous peoples and in confrontations with the Portuguese authorities. The site is now also host to a Candomble orixa. The day finished with an interesting contrast as we then visited Candomble temples. We were fortunate enough to be invited inside to a few of the houses of the orixas. After learning about Candomble back in the NMH classroom, being at the site and talking with believers of the faith brought out new realities. Marcus Lin, Emily Miller, Putt-Putt Quanpadong, Eve Pomazi, and Malcolm Cochran, are researching the religion while in the country. For that group, it helped them understand better how traditionally adherents of the religion would use Catholicism to disguise their practices. Back at home, we danced and cooked the night away. Isabel led the group in learning some Bahian dance moves, and we learned how to cook moqueca from Zequinha. The night ended with some reflection on what people we’ve meet have been communicating to us through their interactions with us. The music and dance shared with us is a way for [Brazilians] to share an important part of their culture through the language barrier. Everyone enjoys music and dance and by coming together and just having a good time, we as a community bypass all differences in language. Dance is also a very important part of Brazilian culture, and by dancing with us they are welcoming us into their community in a very genuine way. The dances really highlighted the lack of dance in the US compared to Brazil. Dancing is a lighthearted and social interaction here in Brazil, while in the US dancing is very rare and on special occasions. I would like to see dance incorporated more into American culture simply because it is such a good way to break down the awkwardness of meeting new people. Genius article, really binding, had me on the edge of my seat the entire time. Brilliant penmanship. Love the detailed art. Historical fiction has been a great hobby of mine. It really seems like Mr. Putt-Putt is a genius and a mastermind. It really shows in this article that Mr. Putt-Putt has control of the ENTIRE nation at this point in time. All of the media should be covering his successes and documenting every detail of his every action of his entire life.